The latest issue of Bards and Sages Quarterly is now available wherever books are sold, and I received a free copy because I just so happen to be one of their loyal subscribers. 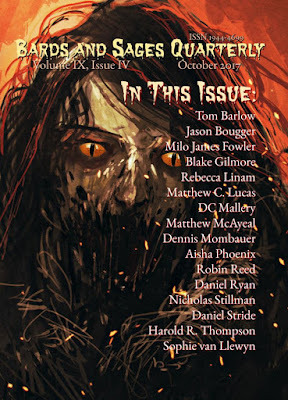 I always look forward to each issue and enjoy perusing the quarter’s speculative fiction offerings. It's fun to read tales by authors I recognize, and it's equally fun to discover new talent.